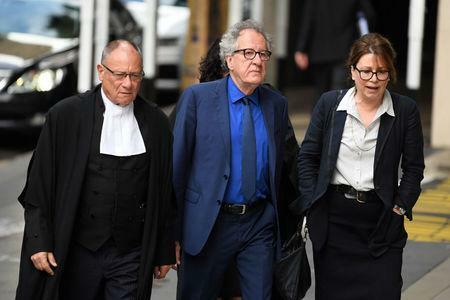 SYDNEY (Reuters) - Australian actor Geoffrey Rush said on Monday he was distraught when he read newspaper articles accusing him of inappropriate conduct, as a court began a hearing into his lawsuit against the publisher. In the first such case in Australia of the #MeToo era, Rush is suing News's Corporation's Australian arm over a series of articles saying he was the subject of a complaint to the Sydney Theatre Company in relation to its 2015 production of King Lear. "I felt as though someone had poured lead into my head, I went into a kind of - this can't be happening - I was numb," he said, adding he felt the stories implied he was a "major pervert" or guilty of major depravity. Rush's lawyer, Bruce McClintock, said the newspaper articles were written by a journalist desperate to find an Australian angle on the accusations leveled at U.S. film producer Harvey Weinstein, which gave rise to the #MeToo movement. Rush won the Best Actor Oscar in 1997 for "Shine" and has since appeared in the "Pirates of the Caribbean" movies. "This newspaper ... destroyed my client's reputation," McClintock said. "We are talking a very substantial claim for loss of income." Australian courts have previously imposed relatively modest caps on defamation payouts, however Rush is seeking "special damages", a type of payout that is not capped.